ABN TV is to provide live coverage of the pre-season Joan Gamper Trophy fixture between FC Barcalona and AS Roma on Sky and to viewers with compatible connected Freeview and YouView devices. The Joan Gamper Trophy is a pre-season tournament featuring international teams as guests at FC Barcelona, and is traditionally used by the club to unveil the team for the forthcoming season. This year marks the 50th occurance of the event. 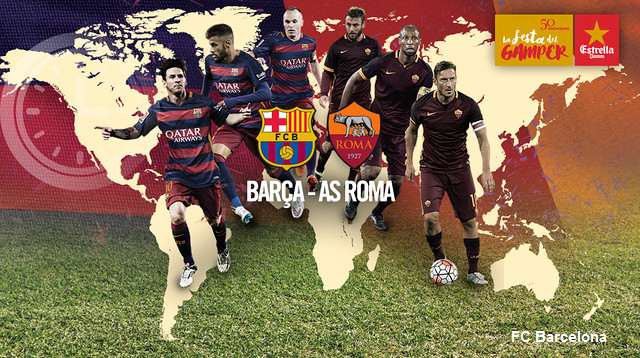 The match kicks-off at 9pm British Summer Time (10:00pm CET) and is also available via the FC Barcelona website. ABN TV is available on Sky channel 235 and on Freeview channel 252. The Freeview service is a so-called 'hybrid service', streamed via the internet to compatible connected Freeview and YouView devices. Generally most current TVs with "Freeview HD" or "Freeview Play" certification, alongside YouView boxes are able to access the channel, but streaming the channel will count towards any data caps you may have on your broadband product. A download speed of at least 2.5Mbps is required for the service to operate correctly.